I hope you have launched joyously into 2019, the new year according to the Gregorian calendar. The Thai calendar, which is a lunar calendar, follows the Buddhist Era and the year is 2562. It’s comforting to think that the Millenium Bug threat was 562 years ago! As we usually approach a new year with new goals and resolutions, it’s interesting to look at words in the <new> family. Have you ever considered that the news we read or watch each day literally means new things? It’s probably generally considered to be a base on its own now rather than a plural. Such is the changing nature of language. Follow this link to an activity you can use or modify to use with your students. Be careful to tell the children they should only make words they know the meaning of and can actually use in a sentence that makes the meaning clear. You can of course introduce one or two new words to their vocabulary. It will be important to have your students use this vocabulary orally as well as in writing in order to solidify it. At the end of the post you can find examples of the word sums your students will be writing, along with examples of sentences they might generate. It’s helpful to look at how an element’s pronunciation can change depending on the affixes added. For example, we pronounce the base <worth> differently when we add the suffix <y> to it. Try it and feel the change from an unvoiced /θ/ to a voiced /ð/. Note, too, even the affix can have different pronunciations depending on the word. The <s> at the end of <news>, for example, is pronounced as /z/ rather than /s/. Pronunciation changes such as these are a feature of English; spelling remains consistent allowing the connections between related words to be clear, regardless of pronunciation. In my experience, students enjoy spotting pronunciation changes and this deepens their knowledge of the orthography of English. You can always simplify a matrix if you think it will be too overwhelming for the level of your students, but try to include an element that will extend their vocabulary once explained. For example, to younger children or non-native English speakers the word <newly> will probably be unfamiliar. 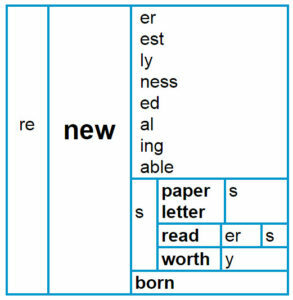 The word <new> is an Old English word so we’ve been using it for a long time. Do you or your students speak some languages other than English? Find out how to say <new> in different languages and compare them. There is a great chance many of the words for <new> started long, long ago as the Proto Indo European word *newo. This wasn’t a written language as it’s so old but linguists have worked out that many of our words originated from this source. Can you see similarities between the words for <new> in their different languages? We have many words in English with a sense of <new> that come from the Latin <nov(us)>. Try to work out what they are! Again, depending on the age and stage of your students you can scaffold them by giving them *the word list found below. Encourage them to make a quick sketch to show the meaning of each word - that increases the chances of them remembering new vocabulary. renovate - renovated - renovating - renovation. What is the term for long fictional narratives, so named because it meant ‘new story’? What is the name of a monk in training? What is a small inexpensive item you buy for fun because it’s new? What do people do when they are presented with a problem they cannot solve with their current technology? What is the name of a person who writes chapter books about imaginary stories? What do people do to their houses when they want them to look fresh and new? What is the explosion of a star called? How do we describe people who find new ways of doing things through inventiveness and creative problem solving? What is a short fictional narrative called? We got this term from Italian. *The answers in no particular order: a novella, a novelty item, novels, renovate, a novice, innovate, a novelist, innovators, a supernova. 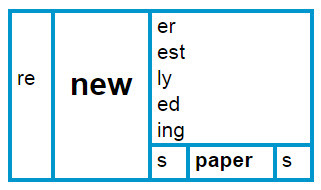 Using words in the <new> family, students can generate a bank of word sums. Be sure to have them use these words in sentences, either orally or in writing. Without doing so they can often tell you what a word means but are unable to use it appropriately. You can see how some words require more formal grammatical structures and thus you begin to build both vocabulary and usage. Sunshine is a renewable energy source. I renewed my library book because I hadn’t finished reading it. We had to go to the embassy for the renewal of our passports. The newly built playground was amazing. The news bulletin informed me of the latest happenings across the world. We made a class newspaper with articles about things that have happened at school. The large stack of newspapers from around the country showed that this issue was of concern right across the nation. We learnt about the recent projects of our community service group from the annual newsletter. Digital newsletters were sent out by the school to alert parents of changes to the daily schedule. The interior designer decided to renew the wallpaper as it was old and tired. My dad bought me a newer version of the game as I’d mastered all the levels already. I am reading the newest book in our classroom library. I am renewing my membership at my football club because this year I think they are going to win the championship. Go Bulldogs! The tsunami was deemed by the editor to be newsworthy due to the large loss of life and the damage to coastal buildings.